sadly decided that as they both got older she may not be able to look after Jessie as she should. 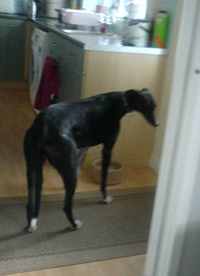 Jessie went to her new home on Sunday 8th September 2013. 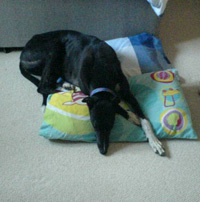 Jessie is lovely small black ex-racing greyhound who has an extremely beautiful and gentle nature. 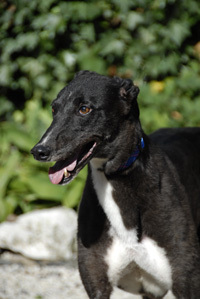 Jessie retired from racing for breeding, but we are not aware of how many offspring she had, if any as none are recorded on the greyhound database. Jessie is a very friendly and affectionate girl who is spayed, recently had a dental and is microchipped and inoculated. She walks nicely of the lead and travels well in the car, but does need a helping hand to get in and out as she's not keen on that aspect of the journey. 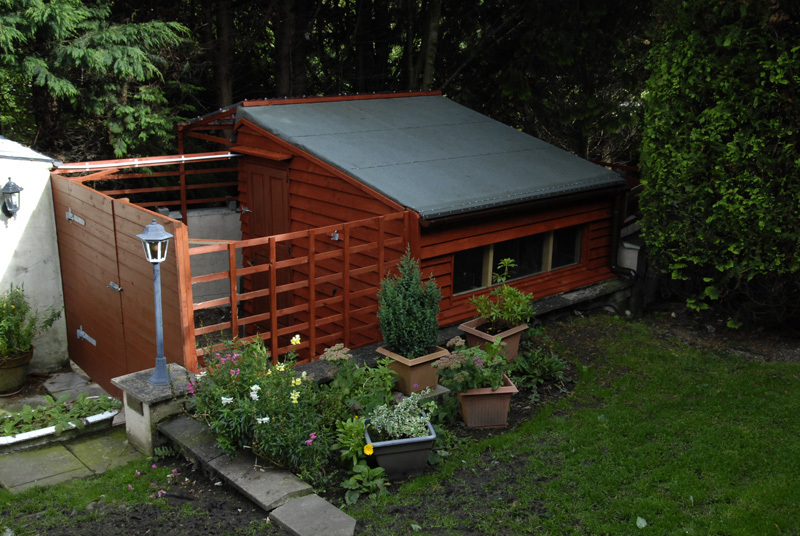 * The branch kennel at the bottom of our garden is where Jessie and the other resident(s) will be for the first day or so until he gets to know the other greyhounds. He has use of our garden and paddock, and once he gets to know the other dogs he will be allowed in the house during the day and all the dogs will then take it in turn to sleep in the house at night, so they become use to sleeping in both the kennel and the house. "Jessie has been very good and has got the hang of going in the garden. She seems to like her food but is definitely upset in the bowel department and has been about 6 or 7 times since last night but only had me up at 2:00 am to go out. I presume this is all the upset but do wonder if the abrupt change of food may not be helping either? She certainly seems to be looking for her breakfast." " Her tum has settled down a lot now. 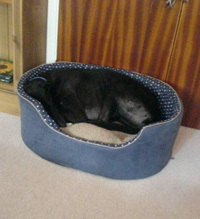 She is sleeping right through the night in the lounge (her choice) – there was a little barking initially. She doesn’t like going down the bungalow steps but is OK going up them. I think this is why she’s somewhat reluctant to go for a walk. It would be no hardship to go out the back entrance and down the drive if she can’t manage.We went to the vets this morning and Jess was very good with all the dogs in the surgery. The vet was pleased with her. I said I thought one of her hips was very slightly off and she confirmed that the left one was a little bit stiffer. She also said she can put on another kg in weight but no more". Jessie's new owner asked if she could be returned for us to assess Jessie with her experiencing the issues she'd come across with her, and to give her time to think seriously about her health and long-term issues of having a big dog. We'd not noticed these issues in the short time she'd been with us before she was re-homed, and we would and let her know how we found things. We received a phone call today from Jessie's new owner saying she felt that things would become more difficult as they both got older and her health declined so could we keep Jessie and find her a new forever home. 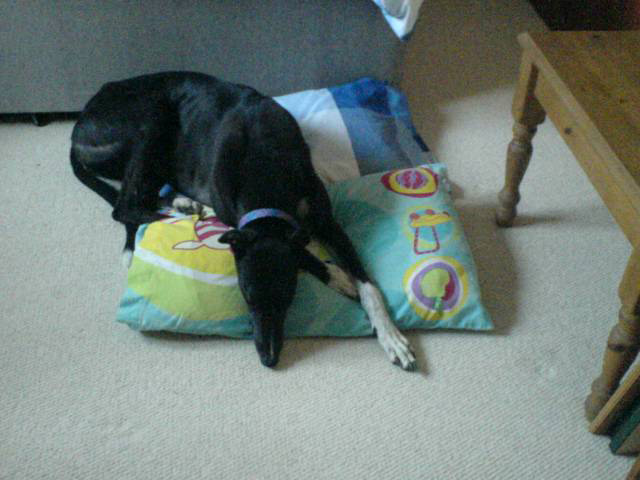 Jessie is a lovely dog and settled back in with us instantly showing no signs of the issues previously mentioned. I don't think we will have Jessie long because she is so nice. A lady called in today to have a look at the greyhounds with a view to re-homing one and fell in love with Jessie the moment she saw her. She wanted to take her home with her, but thought it better tomorrow to ensure she had everything she needed for her. Jessie's new owner arrived this afternoon, completed all the paperwork and took Jessie home with her. Jessie was happy to be going with her, but rested her head on my lap for a stroke for a few minutes before she went. She isn't too keen on jumping into cars so we showed her new owner how to help her in and out, which she says isn't an issue. Jessie is a beautiful girl, full of affection and very adorable - we shall miss her, but we hope she has a long and happy life in her new home. We received an email this evening letting us know that Jess is doing fine. Her new bed is too small as was suspected, so she is dossing down on a couple of pillows until the bed can be exchanged for a larger one tomorrow. She's been a walk and done all her bits. Had her dinner and is now sleeping. We received an email this evening from Jessie's new owner letting us know that Jessie is doing fine, with no problems (so far). She slept all night in the bed she had bought for her, even though she thought it was a bit on the small side. She is a dream to take for a wal, and looks very smart in her new blue coat. She certainly likes her food, and seems to have discovered that when the fridge door opens food usually comes out of it! to curl up and be cosy in! should start to heal shortly now she can't get at it and annoy it. 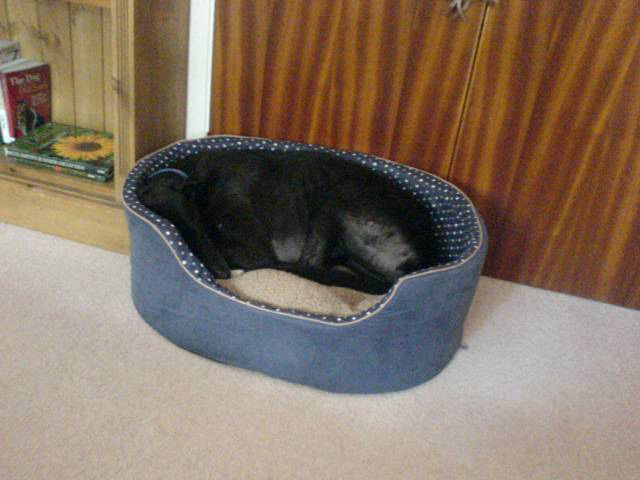 After having two Labradors for eight years Jessie's new owner can't believe how laid back she is. They would be raring to go from 6.30am onwards, Jessie likes to lie in a bit, and as soon as it starts to go dark she's off to her bed. She goes out for a 'last round up' but she takes some persuading. She is adapting well to her new home, but out on a walk a cat suddenly dashed out of the bushes running right in front of her yesterday, which took her by surprise. She certainly perked up at seeing it run in front of her, and seemed to spend most of the rest of the walk looking for another one. We heard today that using the sterile dressings and changing them daily has mean't the cut on Jessie's leg is looking a lot 'better. Apart from that she is fine and is a joy to have. We received an email today letting us know that Jessie is doing well. She's been to Wilf's cafe at Staveley and had a bacon butty (well half of her new mum's). Last weekend they visited her son in Macclesfield and Jessie had a good time playing in Macclesfield Forest with her son's dog before going to a cafe there where she again had half of a bacon sandwich. We heard today that Jessie's personality is emerging, and she's not the shrinking violet she was. She certainly thinks she's a superior being. Her success on the race track must have gone to her head! When they are out walking she trots along like a dressage pony, with an air that says 'look at me'. We received a Christmas card today with news that Jessie is doing fine. She loves a toasted crumpet with butter at bed time and her new owner doesn't get any peace until she's had one. 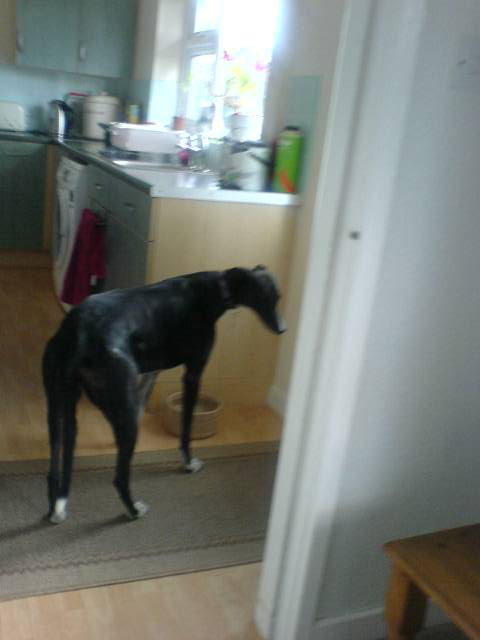 If Jessie doesn't get one on time she will give her owner the greyhound stare' and a squeak until one is made. We received an email today from Jessie's owner letting us know that it is a year today that she adopted Jessie and she wanted to let us know that she is well and happy, the joy she has given her, and how much she is loved. Received a message from Jessie's owner who said Jessie was 10 years old last October, is doing fine, and is very much loved. She is a laid back girl with such a sweet nature and she captures the hearts of everyone who meets her. We heard today that Jessie is almost 12 years old and doing well, super news.